Counselor to the president Kellyanne Conway responded to allegations that President Donald Trump is a racist, saying "none of us would be" at the White House if that were true. 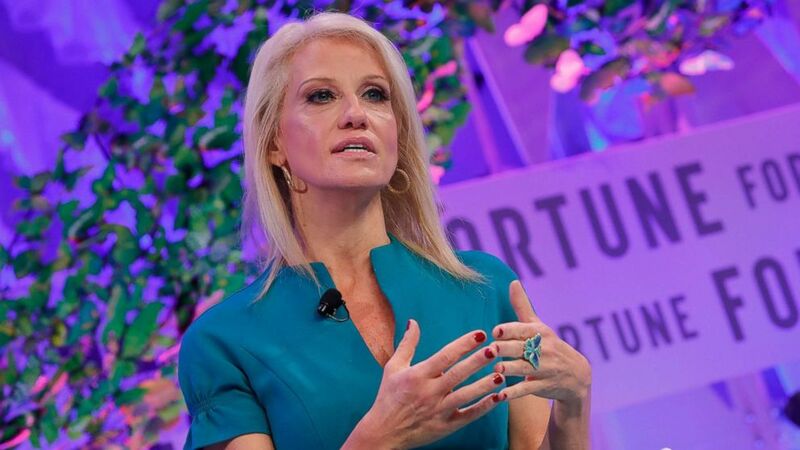 Conway also told ABC News Chief White House Correspondent Jonathan Karl on "This Week" that in the two years she has worked for Trump, she has "never a single time heard him use a racial slur about anyone." Conway was responding to a new book by former White House staffer Omarosa Manigault Newman who describes Trump as a racist and that she has heard him use racial slurs. "I think that Omarosa unfortunately has undercut her own credibility," Conway told Karl. "This is somebody who gave a glowing appraisal of Donald Trump the businessman, the star of 'The Apprentice,' the candidate, and indeed the president of the United States. She told your own network, Jon, ABC News, the day after she was fired from the White House that she had resigned ... She said she never heard him use the N-word." "I have never a single time heard him use a racial slur about anyone. I also never heard Omarosa complain that he had done that, and so the only thing that's changed is that she's now selling books," Conway said. Manigault Newman's new book, "Unhinged," is set to be released Tuesday. According to The Guardian and The Washington Post, both of which obtained advance copies, Manigault Newman writes that Trump is a "racist, bigot and misogynist." Manigault Newman's title at the White House was assistant to the president and director of communications for the Office of Public Liaison. She was the most senior African-American staff member in the West Wing. Conway said that Manigault Newman "should be taking credit" for Trump administration achievements that benefit African-Americans. "I think Omarosa is a tremendous disappointment here because she should be taking credit for all the great gains that this president has made with respect to that low unemployment number among African-Americans," Conway said. Karl pressed Conway on who is "the most prominent, high-level African-American serving in the West Wing on President Trump's staff" since Manigault Newman's departure in December. When she mentioned Housing and Urban Development Secretary Ben Carson, Karl reinforced that he was asking about "White House staff...the people the president is with every day." Conway mentioned Ja'Ron Smith, special assistant to the president for domestic policy, whose office is in the Executive Office of the President, Conway said. Karl said, "But [he is] not in the West Wing. What does that say to have not a single senior adviser in the West Wing who's African American?" Conway said she "didn't say that there wasn't" a senior African-American adviser in the West Wing, but that the focus should be on the president's actions. "The fact is that this president is doing well for all Americans. He promised on Nov. 9, on his election night ... He said I will be the president for all Americans, even those who didn't support me ... And he's made good on that promise," she said. Karl said later in the show that none of the "55 top-paid staffers" at the White House are African-American. "There is no African-American at that top level," he said during a "This Week" roundtable. Karl was responding to former White House Legislative Affairs Director Marc Short who named some African-American members of the president's staff not mentioned by Conway. Short said there is "Mary Elizabeth Taylor, who is an African-American staffer on our team who did more in this White House to get Neil Gorsuch confirmed [to the Supreme Court] than anybody else. She led all of our confirmations." He continued with praise for Ja'Ron Smith and for Daris Meeks, a senior member of Vice President Mike Pence's staff. "There's a lot of focus in the media on Omarosa, but there's less focus actually on those who are doing really hard jobs and doing really good work for the president," Short said.